Humidify your space wherever you go: home, office, or on-the-go. 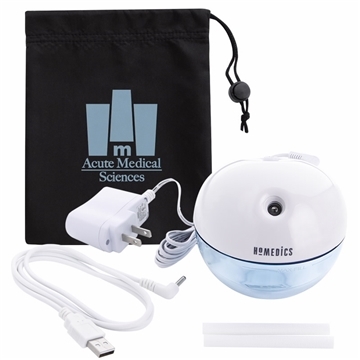 Ultrasonic technology allows for virtually silent operation and micro-fine mist. Provides up to 4 hours run time. Water reservoir with a capacity of 7/8 cup of water. Material: Pouch: Dacron, Humidifier: Varied. Obviously on time delivery and product quality is important but Rosa was excelent answering all my questions and clarifying all my doubts always in a very nice manner and very professional. The size seems to fit everyone's needs, not too big and not too small. Great value for this item. I've been ordering it for a year now and always has a great quality. It's great. I'm very satisfied.